Caesar's 54BC invasion, which ultimately ended in retreat, came almost 100 years before Claudius's conquest in AD43. The 5m-wide ditch was discovered during an excavation ahead of a new road being built. The university said its shape was very similar to Roman defences found in France. It is thought it formed part of a large fort protecting Caesar's ships on the nearby beach. Born into a prestigious patrician family in 100BC, he became one of the key figures in 1st Century BC Roman politics. He formed a political pact, known as the First Triumvirate, with Pompey and Crassus. After successful military campaigns against the Gauls he invaded Britain, where he was eventually forced into retreat. He defeated Pompey in a civil war and declared himself dictator, but was famously assassinated by Brutus, Cassius and other senators in 44BC. His adopted son Octavian became Augustus, the first Roman Emperor. Pottery found at the site was consistent with the 54BC arrival date and the team also found iron weapons, including a Roman javelin. Archaeologist Dr Andrew Fitzpatrick said descriptions from Caesar's account of the invasion - which describes him leading a force of about 800 ships, 20,000 soldiers and 2,000 cavalry - suggested it was the correct landing site. "The presence of cliffs, the existence of a large open bay, and the presence of higher ground nearby, are consistent with the 54BC landing having been in Pegwell Bay," he said. "It's a big force, and you need a big landing place, because simply to land that number of vessels you need a big front. "We think that the location of the site fits very closely with what Julius Caesar gives in a series of clues - he doesn't tell us in detail, but he gives some snippets, and by piecing those snippets together we think it fits very well." Dr Fitzpatrick said the low-lying, coastal nature of the site was "defending the coast rather than looking inland", which led them to believe it could be Caesar's base. Prof Colin Haselgrove, who led the investigation, said it was likely treaties set up in the wake of Caesar's invasion made it easier for the Romans to conquer parts of Britain almost 100 years later. He said: "The conquest of south-east England seems to have been rapid, probably because the kings in the region were already allied to Rome. "This was the beginning of the permanent Roman occupation of Britain, which included Wales and some of Scotland and lasted for almost 400 years." 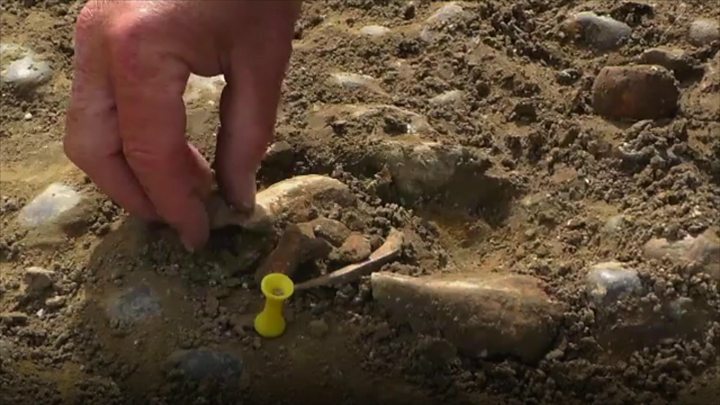 The findings will be explored further as part of Digging For Britain, on BBC Four at 21:00 GMT and afterwards on BBC iPlayer.